Combine the wet ingredients in a mixing bowl and whisk together very well. Pour the wet into the dry ingredients until everything is evenly moistened. Spoon batter into loaf pan, distribute evenly along the pan. Bake for 50 minutes to an hour until a knife comes out clean. 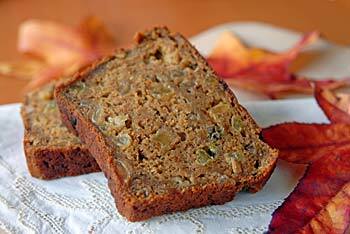 Posted by Chris Walker on November 20, 2006 in Breads and Muffins, Desserts and Sweets, Pumpkin.